New ‘Game of Thrones’ Season 7 Trailer Breakdown: 13 Hidden Secrets Revealed! Just under a month from its premiere, Game of Thrones blessed us with a second Season 7 trailer, placing the Night King front and center for the Great War to come. Just like last time, we couldn’t help diving deeper into every frame of footage. Beware of major SPOILERS, and check out everything we found in our inside look at the secrets of HBO’s new Game of Thrones Season 7 trailer! Don’t fight in the north, or the south. Fight every battle, everywhere … always, in your mind. This isn’t a new shot, but one of the first three snippets of footage released of Season 7 in HBO’s overall 2017 trailer. Still, given the accompanying words from Littlefinger and Sansa’s own narration over the trailer’s closing moments, things aren’t looking great for her relationship with Jon Snow. Someone’s ready to take charge on her own. 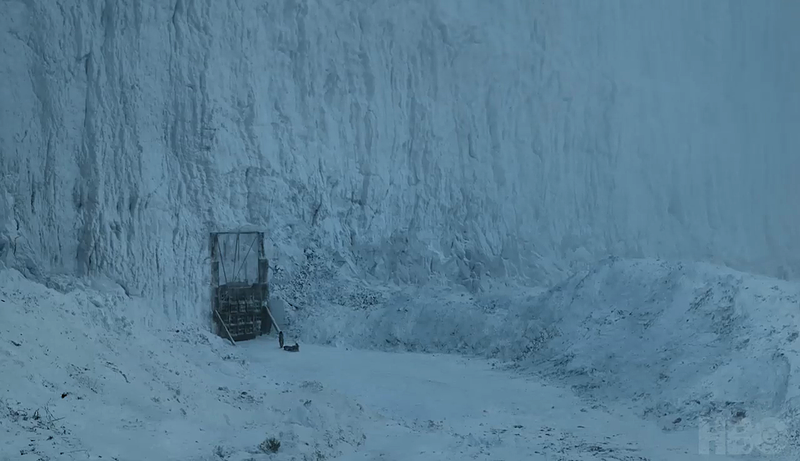 We saw the underside of this gate in the last trailer, but this shot at 0:18 is almost certainly that of Meera dragging Bran to the Wall’s northern exterior, as matched with this shot. Considering Benjen/Coldhands left them at the Weirwood tree by The Wall, it probably won’t take long into Season 7 for this scene to unfold. 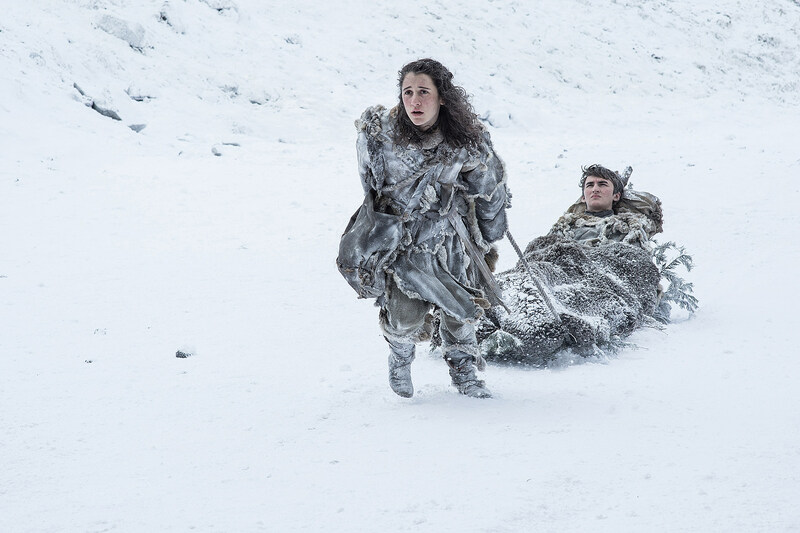 We’ll come back to Bran in much cozier circumstances later in the trailer, but at least he’s done being carried around in the snow! 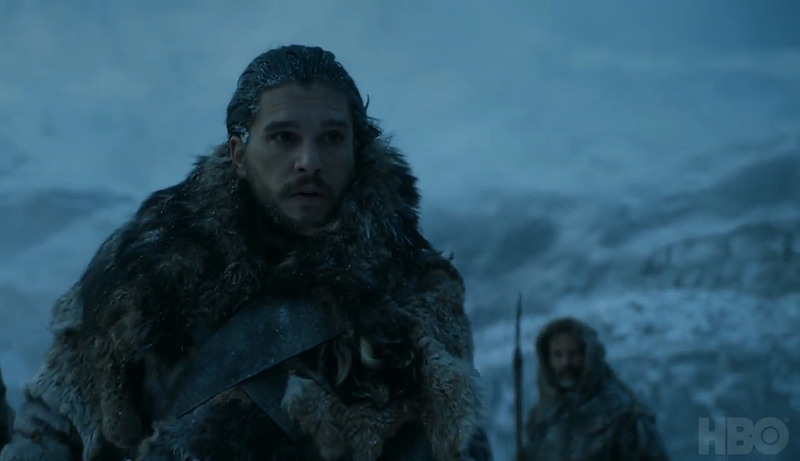 Almost every shot we see of Jon in the new trailer follows some battle or expedition north of The Wall, so we’ll come back to this moment at 0:21 later. We can’t quite make out Jon’s companion in the lower right, but it’s worth mentioning they have an astonishing resemblance to Stannis Baratheon (it’s not him, guys). 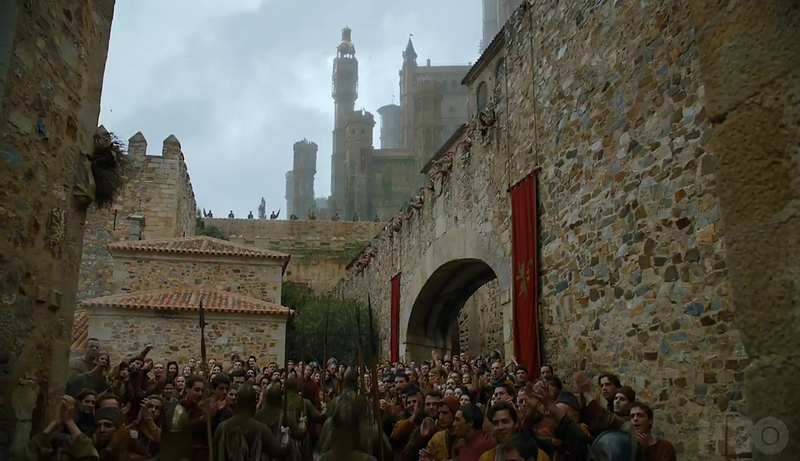 Here’s an interesting one at 0:26, as citizens of Kings’ Landing are clearly cheering for someone. Cersei doesn’t seem the type to inspire reverie in the streets, but clearly something about this parade has Kings’ Landing in good spirits. Be warned of Googling set photos for Season 7, as you might just find your answer. 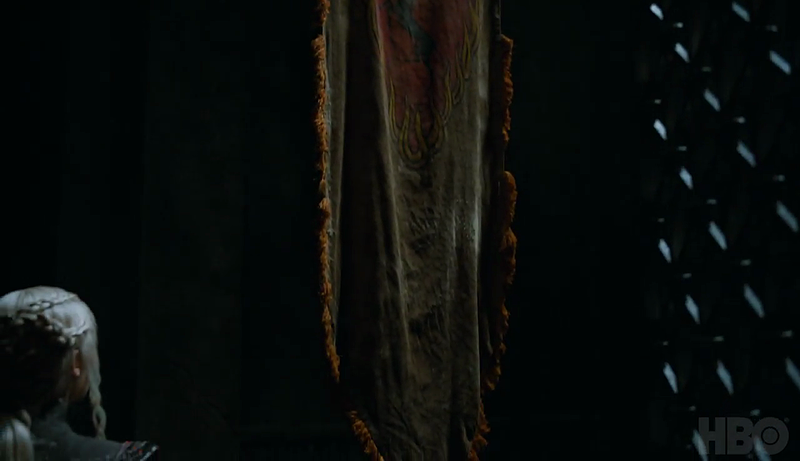 Prior trailers and photos have made no secret of Daenerys settling into her new home at Dragonstone, and at 0:48 we even see her tearing down one of Stannis Baratheon’s old banners (note the burning heart sigil). A Meeting of Ice and Fire? For centuries, our families fought together against their common enemy. Despite their differences, together. We need to do the same if we’re going to survive, because the enemy is real. It’s always been real. We’re going to cheat a bit here, but the above dialogue is delivered by Jon as Dany arrives in Dragonstone. It sounds like a pitch Jon would make to another house (not the Targaryens), but the juxtaposition is hard to ignore. 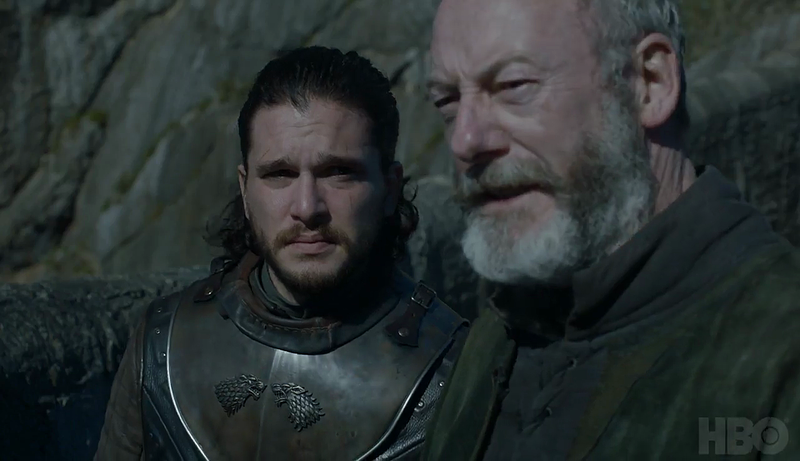 There’s also the above shot of Jon and Davos all the way from 1:23, which looks more like sunny Dragonstone than the North, right? 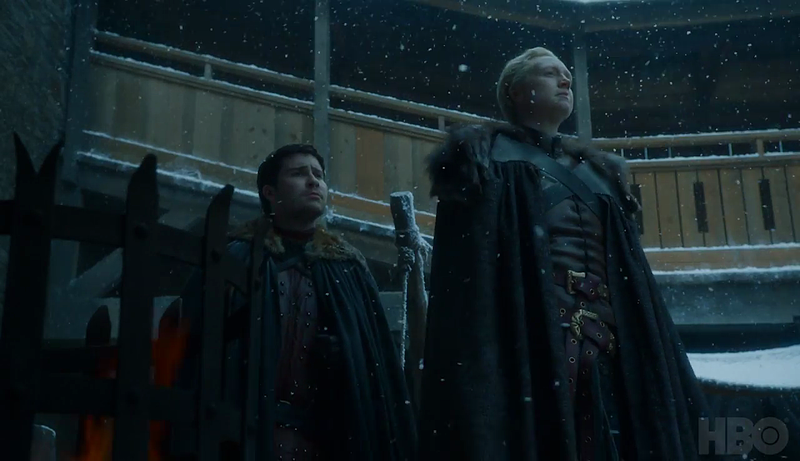 Hey, It’s Brienne and Pod! 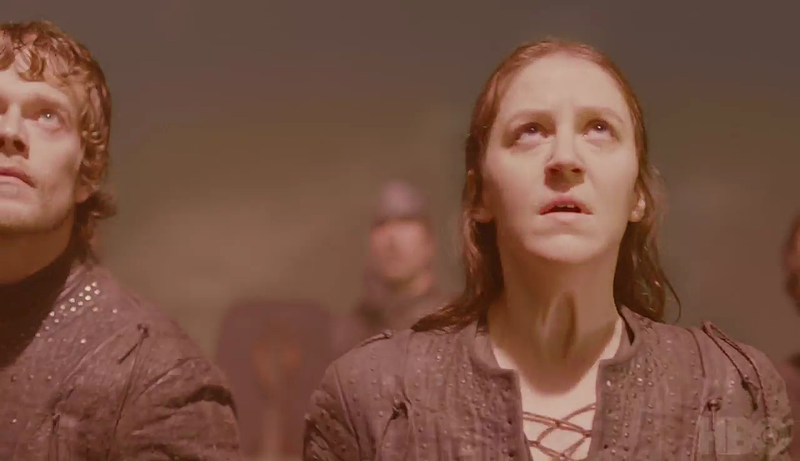 The two make a solitary appearance at 0:59, presumably at Winterfell. And look, The Hound at 1:00! Sometimes it’s just nice to check in, folks. Things get a little complicated at 1:02, as we see Jaime and Bronn (gulp) overseeing a battalion of (Tarly?) soldiers in generally fair weather. 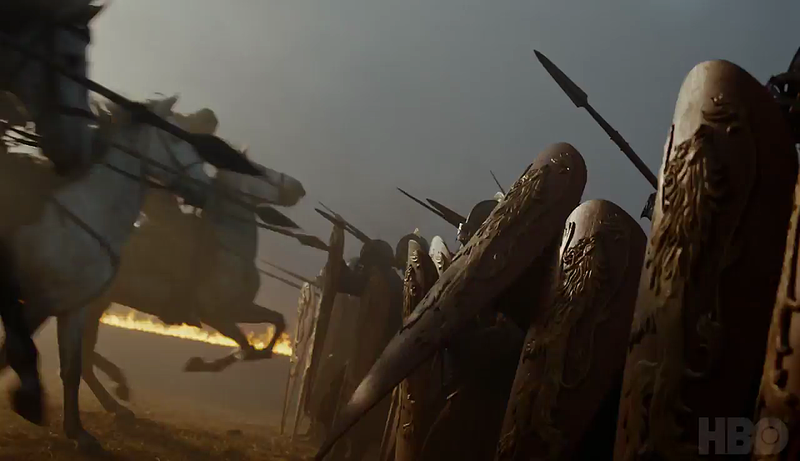 If we look back at 1:01, the Dothraki-Lannister battle glimpsed in the last trailer has a very different sky, though the background fire and smoke are most likely from Dany’s dragons. 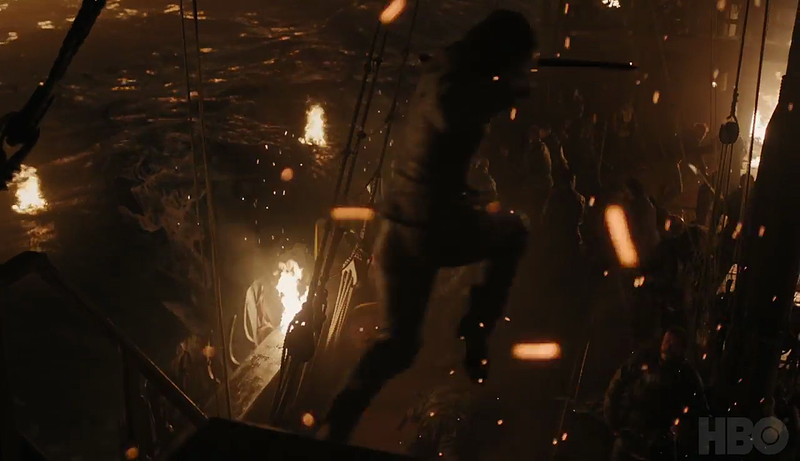 Plus, at 1:14 you’ll see Jaime making a mad charge through the burning field, absent Bronn (double-gulp). 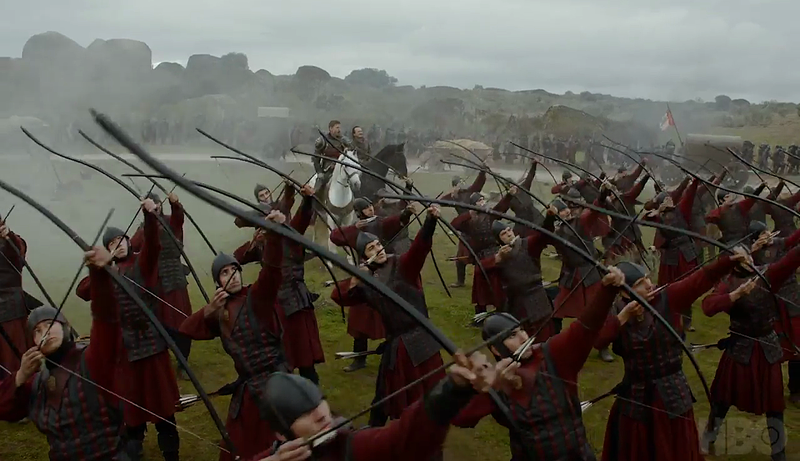 If we presume the first trailer’s battle to be Casterly Rock, does this mean Jaime’s leading the defense, or is it another battle with Daenerys’ forces? 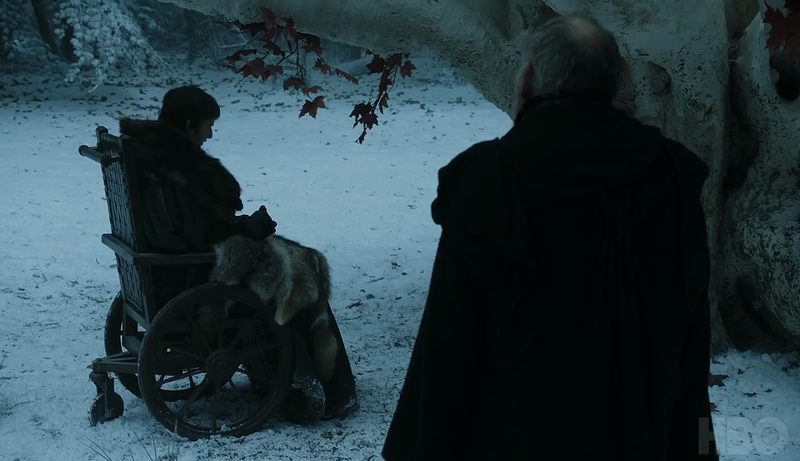 At 1:03, we see what editing suggests as Bran warging into a crow over The Night King and his army; quickly detected by the snowy big bad.. Perhaps more curious is that Bran somehow obtained a wheelchair, and a new Maester friend. The location looks more like the Weirwood tree north of The Wall than in Winterfell, but it’s plausible Bran ends up home this season regardless. Ah, nothing like watching Beric Dondarrion light up that flaming sword of his. 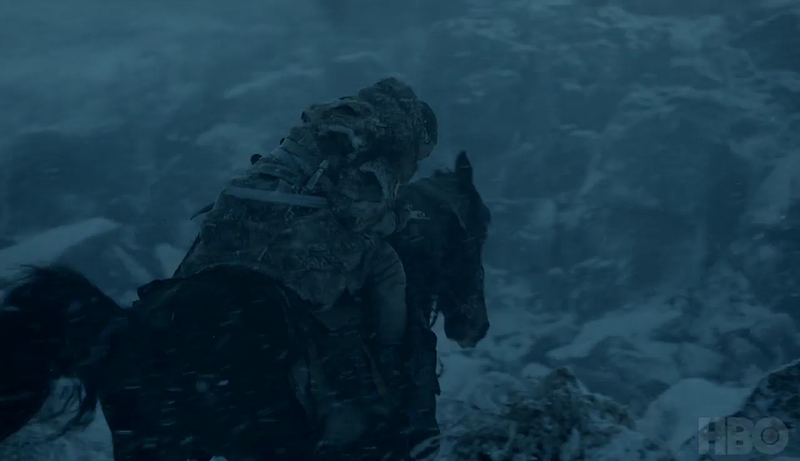 Photos of he and The Hound have clearly been set up north in colder weather, but if you look closely at a shot of Jon facing the army of the dead at 1:20, the same flaming sword suggests these two parties’ paths have definitely crossed. 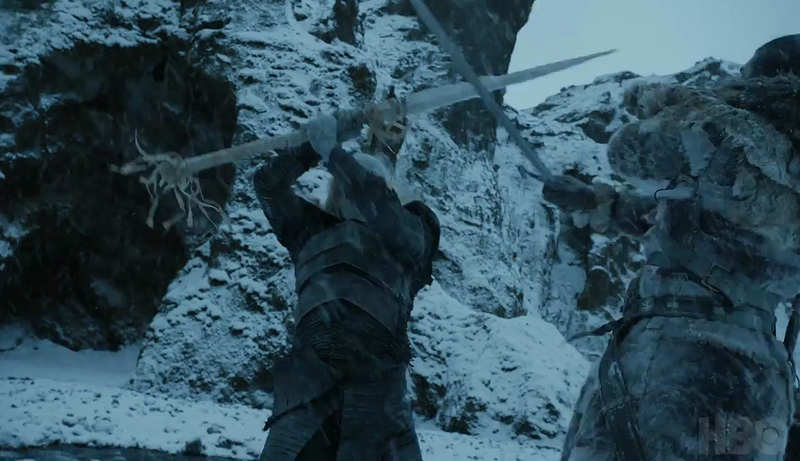 … though clearly shots of Yara and Theon peppered through the trailer belong to the same fiery attack. LOOK AT THE SIZE OF THAT THING. Not every scrap of footage needs explanation. 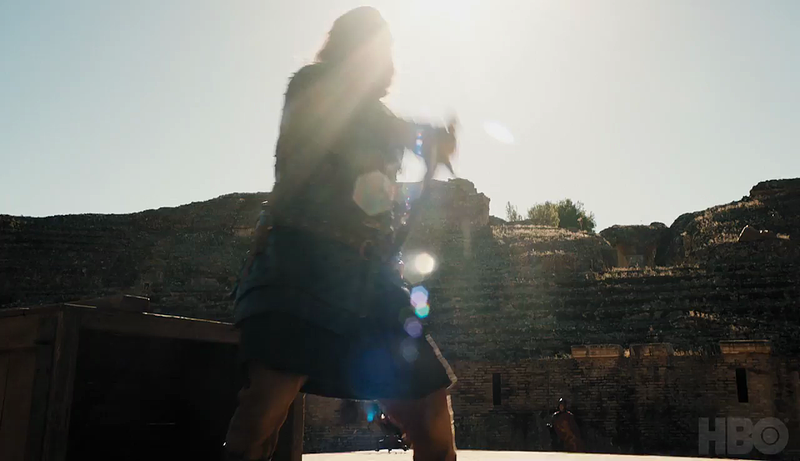 Perhaps one of the trailer’s most deliberate mysteries arrives at 1:23, as a sun-silhouetted figure draws their sword in what appears to be an arena setting. 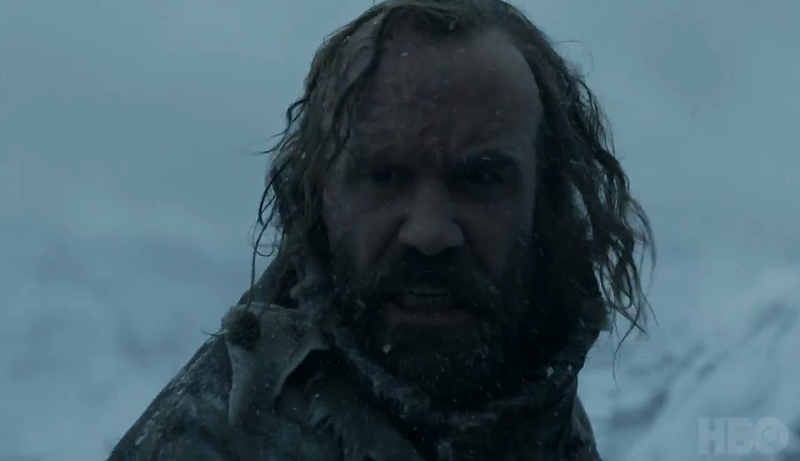 The figure most clearly resembles The Hound, though clearly something would have happened to bring Sandor Clegane back from the snowy setting glimpsed earlier. There’s also a Lannister guard visible in the background, but we might actually have an answer here that requires significant SPOILER WARNING. The arena is almost certainly that of the ancient Roman ruins of Italica, found in Santiponce, Seville, which were said to stand in for the Kings’ Landing “Dragonpit,” and perhaps feature a meeting of all the major characters. 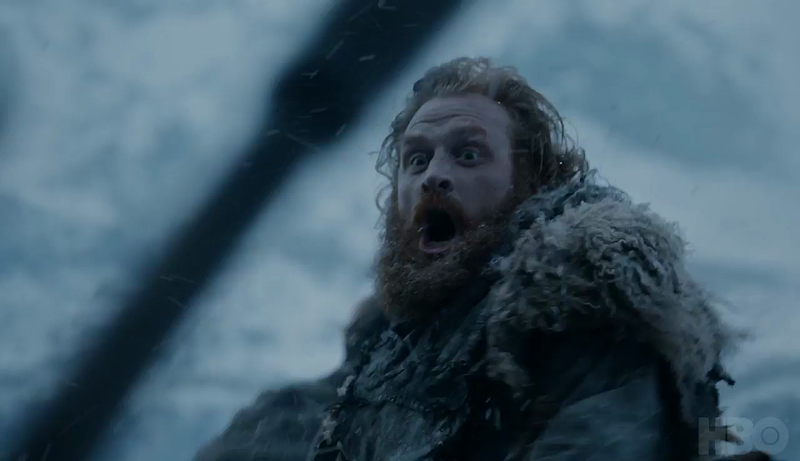 WE’RE WORRIED ABOUT YOU, TORMUND. 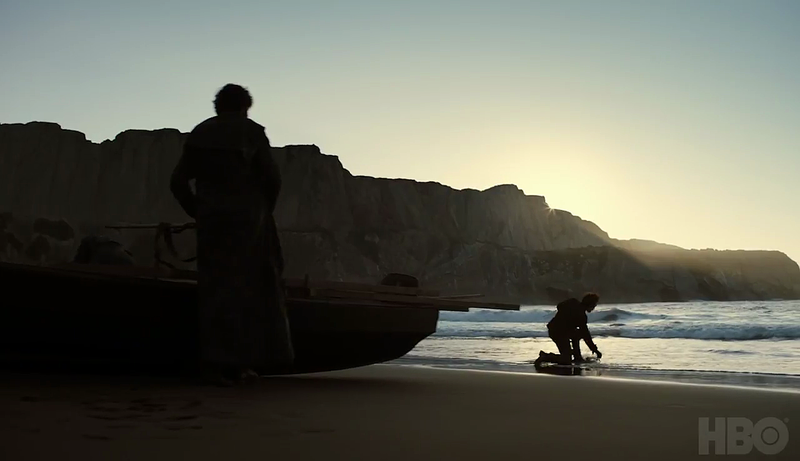 We’re guessing this angry beach-dweller at 1:24 is Theon (not Charlton Heston), judging by the general silhouette, and long Ironborn dress of his crewman. 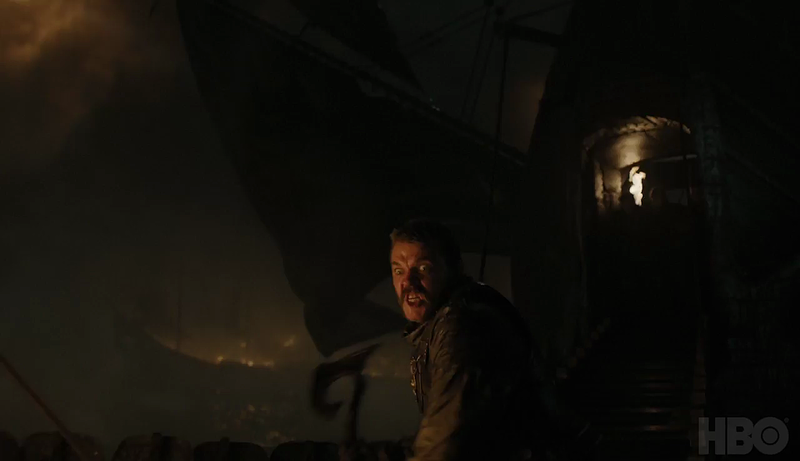 The rowboat might also indicate that this takes place after Euron’s attack on the fleet, with Theon making a narrow escape. Was Yara not so lucky? LOOK AT ITTY-BITTY DAENERYS ATOP THAT THING. 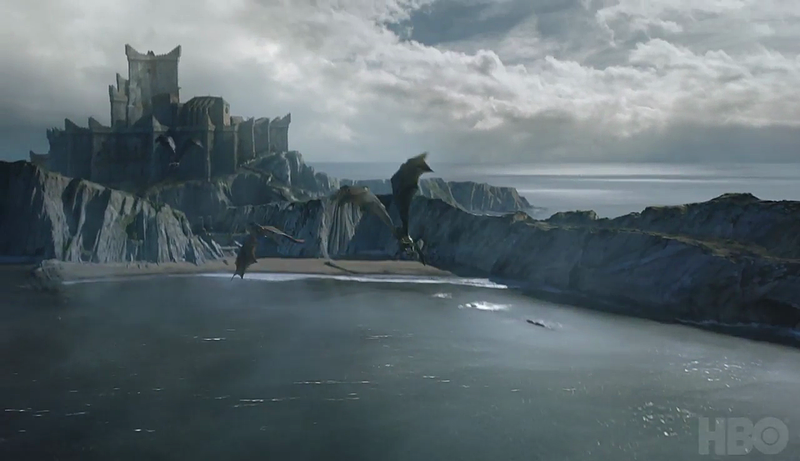 And for what it’s worth, this shot at 1:26 appears to have Dragonstone in the background, so Dany might be making a grand entrance to impress some new visitors. When the snows fall and the white winds blow, the lone wolf dies. But the pack survives. 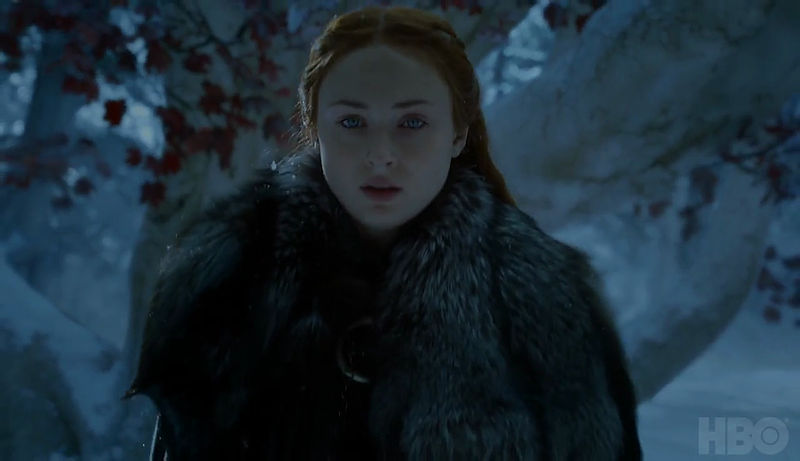 Sansa’s sinister narration closes the trailer over shots of a lone figure riding on horseback up north. The dialogue itself is actually a quote from Ned Stark in the books, but it certainly seems like Sansa is painting Jon as a “lone wolf” in the north. 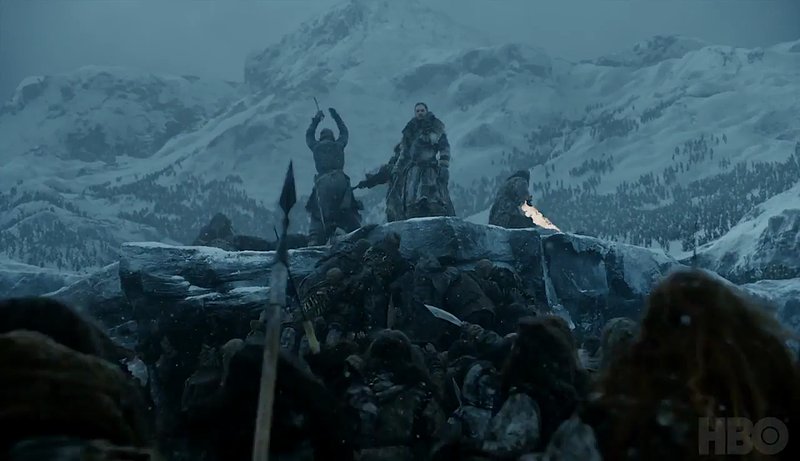 The final shot itself appears to show Jon taking down a Wight and facing the full army of the dead. The Great War is definitely here. Well, what do we think? 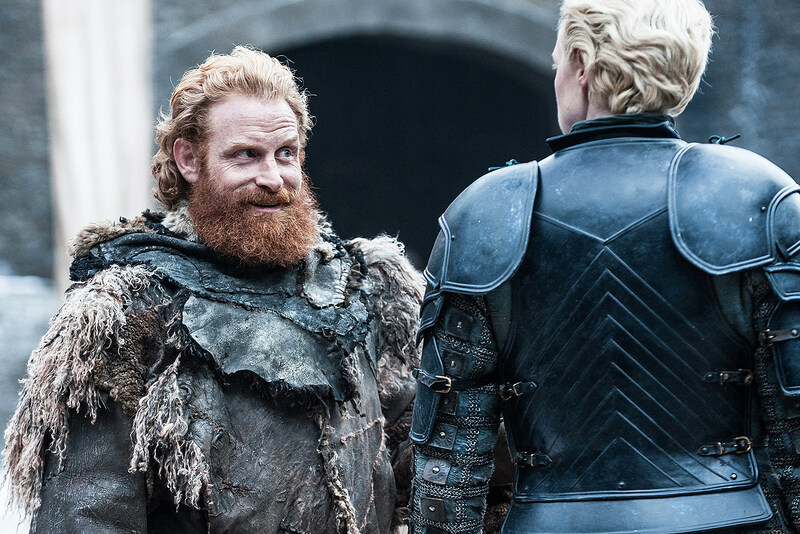 Does Game of Thrones Season 7 seem like the biggest yet? What other details from the trailer are worth another look? Stay tuned for the latest, and get ready to return to Westeros for the July 16 premiere! Source: New ‘Game of Thrones’ Season 7 Trailer Breakdown: 13 Hidden Secrets Revealed!